Repair and restoration to Omega Timepieces. Certified Omega Service Provider. Swatch Group U.S. In 2013 I travelled to North America, where I successfully completed Omega Service Provider with The Swatch Group U.S. So what is that I hear you ask ? Training is provided to Qualified Watchmakers in America to enable them to have the correct factory training on how to service new Omega Products. If you don't do the training, have the correct factory tools and lubricants to do the job, you cant have access to factory Omega spare parts. The Co-Axial escapement does require special factory tools, training and lubricants to be able to service it correctly. I am the FIRST and ONLY Independent Australian Watchmaker to complete Omega Service Provider Training in America. I have read various sites saying that they service the Co-Axial. Training is NOT available to Independent Watchmakers in Australia. I dont know about some of their claims!! We service all types of Omega Pocket watches and wristwatches. Drop your timepiece in for a free estimate. The 2 level Co- Axial in motion. 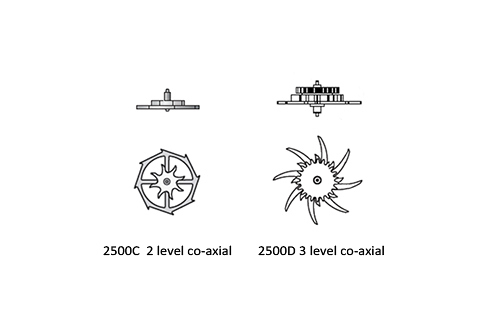 Three level Co-Axial with pallets. The special factory holder for locking and unlocking of the Co-Axial escapement.This is used for the fine oiling of the Co-Axial wheel teeth, which is done under a microscope.